Melt unsweetened chocolate squares in a heavy saucepan. Cool slightly. In a large bowl beat 1/2 cup shortening and butter or margarine with an electric mixer on medium speed until butter is softened. Add the sugar and brown sugar and beat until fluffy. Dissolve the instant coffee crystals in the water. Add the melted chocolate, egg and coffee to the butter mixture and beat well. Stir flour, cinnamon and salt together and add to the butter mixture. Cover and chill about 1 hour or until easy to handle. Shape into two 7-inch long rolls. Wrap in plastic wrap and chill for at least 6 hours or overnight. Cut into 1/4-inch slices and place on an ungreased cookie sheet. Bake for 10-12 minutes. Remove to a wire rack and cool. Melt the semisweet chocolate pieces and 3 tablespoons of shortening over low heat. 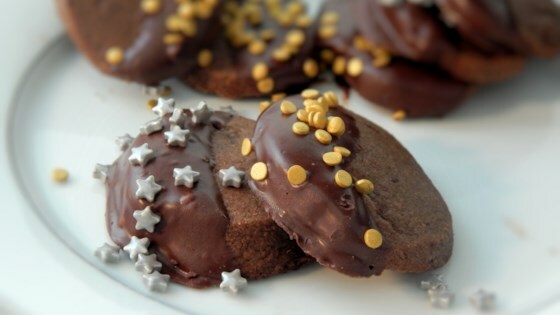 Dip on half of each cookie into the chocolate mixture. Place on waxed paper until the chocolate is set. I make these every year at Christmas and they are always a hit. I lost my recipe, but you have saved the day. The name of my recipe is "Cappachino Flats" but the ingredients are the same. These were soooo good! The texture was perfect, they were light and crisp and had great flavor.